Miles Gilbert “Tim” Horton (1930-1974), was born in Cochrane where he grew up playing ice hockey. Scouted by the Toronto Maple Leafs as a future draft pick, he was signed and attended St. Michael’s College. A powerful player, Horton was recognized as the best defenceman in the Ontario Hockey Association in the 1948-49 season. Horton played his first game with the Toronto Maple Leafs in 1952 and helped the team win four Stanley Cups before being traded to the New York Rangers. In addition to playing hockey, Horton was a business entrepreneur. His most successful business was Tim Horton Donuts, which opened its first store in 1964 in Hamilton. He co-founded the store with Roy Joyce and they became full partners in 1967. Although the Tim Hortons brand has its origins in sport, it is now emblematic of community identity. 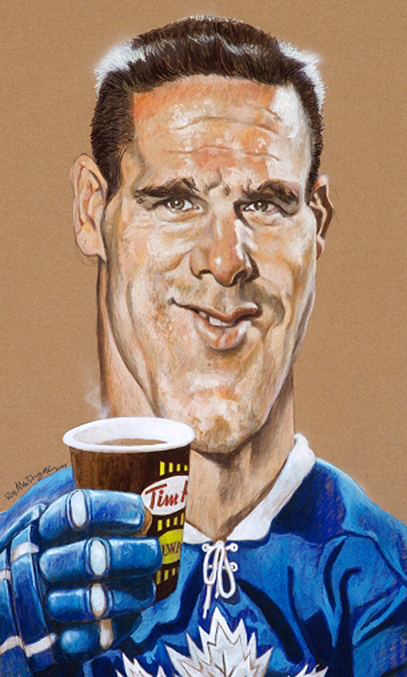 Learn more about Tim Horton and the franchise on the Tim Hortons website. Read more about the original store from the CBC and see a timeline of its evolution. Learn more about Tim Horton from the Hockey Hall of Fame website.